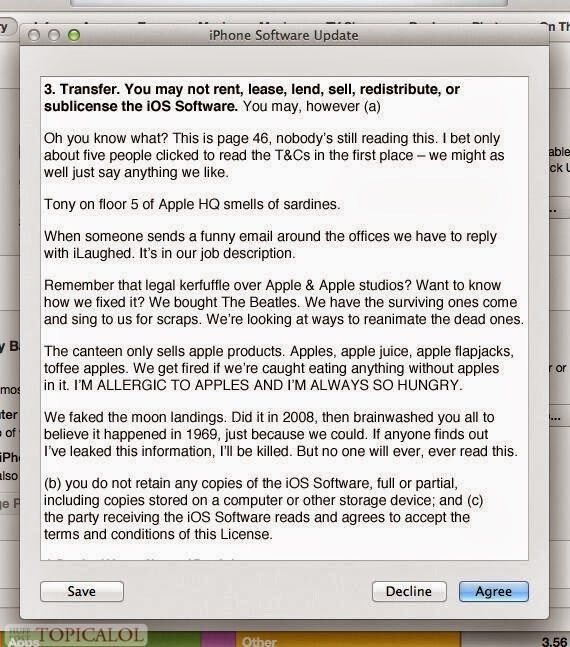 Page 46 of the Apple Terms and Conditions for iOS 7, laugh your hearts out. Daniel Stevenson who goes with the Twitter handle of @Danny_Phantom43 has posted this one on Twitter. It is the Page No.46 of the Apple's Terms and Conditions, you have accept before you download iOS 7 on your iPhone, iPad or iPod Touch. The Twitter image has already gone viral with 4735 retweets and 1861 favourites and counting. Some of the replies have said that this is a fake and original was posted on Reddit but I am reproducing the tweet below all the same.